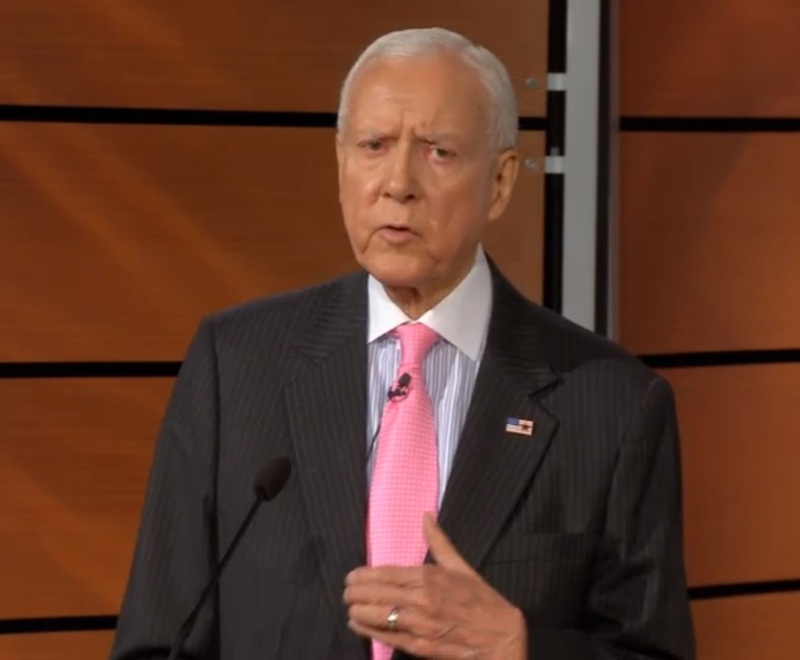 Sen. Orrin Hatch is Wrong on the Budget: We Need More Revenue! Based on the most recent CBO (Congressional Budget Office) data, revenues are projected to average 18.3% of the economy through 2023, almost a full percentage point over the average of the past 40 years. So, despite the repeated claims that we don’t collect enough revenue, we are actually set to collect more than the historical average. At the same time, federal spending over the next 10 years will average 21.1% of the economy according to the CBO – actually, I think it will be much higher than that – exceeding the 20.4% average of the last 40 years. In other words, anyone claiming the lack of revenues is the root of our fiscal problems just hasn’t studied the numbers. First, I’m going to correct Senator Hatch. Last week, the CBO updated its budget projections for the next 10 years. Government revenue averages 18.9% of GDP from 2014-2023 and federal spending averages 21.9%. These numbers are actually both higher than the ones Hatch cited so they actually help the Senator’s case that we need to reign in federal spending. Over the next couple of decades, federal spending will be significantly higher than it has been over the past 40 years, because baby boomers are retiring. The aging of our population increases the costs of entitlements and there’s nothing we can do about that if we are to uphold our contracts to our parents and grandparents. In order to keep those promises, it’s going to require increased government revenues to fund those programs. There’s no escaping that fact. Those numbers come from the CBO’s 2012 Long-Term Budget Outlook*. When performing these calculations, the CBO is forced to make a number of assumptions about future policy. They do so under two different scenarios. The first, known as the extended baseline scenario, assumes that the Bush tax cuts expire, that sequestration stays in effect and that Congress will no longer pass a doc-fix each year. None of those are realistic. That’s why the CBO created the extended alternative baseline scenario. It assumes the extension of the Bush tax cuts, that sequestration will be overturned and Congress will continue to pass a doc-fix each year. Of course, we now know that the Bush tax cuts were extended for all but the wealthiest Americans, and sequestration is looking more and more like permanent policy. But this report was from June 2012 so it’s a bit out of date. However, my point still holds. Since the extended alternative baseline scenario more closely aligns with the American Taxpayer Relief Act (which extended the Bush tax cuts) and expected future policy, I will use CBO’s projections under it. As you can see from the table above, federal spending is predicted to increase significantly over the next 25 years as a percentage of GDP and that increase is driven entirely by growth in entitlements. Through 2022, the aging of the population will cause spending on the major health care programs and Social Security to rise significantly, CBO projects. In fact, during that period, almost all of the projected growth in such spending as a share of GDP is effectively the result of aging. Aging remains the more important factor for a few decades following the coming one. To demonstrate this, let’s assume that there is no excess cost growth in entitlement spending over the next 25 years (meaning health care costs grow at the same rate as inflation). Thus, the only increase in costs is from an aging population. To calculate this, we can multiply the estimated increase in Social Security, Medicare and Medicaid (6.2 percentage points) by 0.68 to eliminate all excess cost growth. The answer is 4.2%. This means that aging of the population will cause entitlement spending to rise 4.2 percentage points over the next 25 years. If you factor that in to total spending, the federal government will spend approximately 24.2% of GDP in 2037. That’s not sustainable without increased revenues. Economists and budget wonks generally agree that the U.S. should aim for a budget deficit of 3% each year. If federal spending is 24.2%, revenues will have to be 21.2% to hit that 3% mark. That’s WAY above our historic level. It’s WAY above our current level. And this is working under the assumption that there is no excess cost growth in entitlement spending. We’ve done a better job of controlling healthcare costs over the past few years, but we’re not going to get to zero excess cost growth anytime soon. Sen. Orrin Hatch (R-UT) speaks at the National Journal policy summit. Hatch’s claim that we have a spending problem is technically true, but it’s an unavoidable spending problem. If Hatch wants to keep revenues at 18.9% – the CBO’s prediction for the next 10 years – he would have to cut spending by 2.3 percentage points (to 21.9% of GDP) in order to keep the deficit to 3%. And that’s still assuming there’s no health care excess cost growth. Since Hatch wants to do that by cutting entitlements, he’ll have to reduce them from an expected 14.6% of GDP to 12.3% in 2037. That’s a huge cut. To put this in perspective, two of the most common suggestions to reduce the budget deficit are to raise the Medicare and Social Security eligibility age to 67 and to switch to chained-CPI to calculate yearly changes in the cost-of-living adjustment for Social Security benefits. The CBO found that raising the eligibility age would reduce the long-term budget by 0.4% of GDP by 2035 while switching to chained-CPI for Social Security would reduce the deficit by 0.2%. That’s nowhere close to enough to both keep revenues at 18.9% and keep the deficit to 3%. All of this is to say that Hatch and his fellow Republicans need to go back and look at these numbers again. It’s simply not possible to keep our promises to seniors, keep the budget deficit to 3% and keep revenues unchanged. Demographic changes make it impossible. But it’s not just Republicans who believe this. To pay for our entitlement programs, we’re probably going to have to raise taxes on the middle class. We have a big gap to make up and as I just demonstrated, we can’t do it with spending cuts alone. That’s going to require everyone else to pay more as well. How many Democrats have mentioned this though? Very few. They don’t have any interest in increasing revenue as well. Right now would be a poor time to raise taxes on the middle class of course, but at some point it’s going to need to happen and most Americans have no idea that it’s coming. Years of Republicans claiming we don’t need more revenue and Democrats promising not to raise middle class taxes have lulled the country into a false belief that taxes aren’t going up. They are. An aging population requires it. It’s about time politicians revisited these numbers and stopped fooling their constituents. Either we break the promises to our seniors or we increase revenue. There are no other options. *The CBO is releasing its 2013 Long Term Budget Outlook tomorrow. I’ll have a full update on the numbers then. President Obama unveiled his budget yesterday and liberal groups have responded angrily to the inclusion of Chained-CPI in the proposal. A quick recap: currently Social Security benefits increase each year to keep pace with inflation according to the Consumer Price Index (CPI). The current calculation for inflation does not take into account that when the price of one product increases, people will switch to a lower-priced substitute instead of paying the higher price. The classic example is that when the price of beef rises, people buy more chicken and less meat, so the actual increase in the cost-of-living is not equal to the rise in the price of meat. Chained-CPI takes this into account. Since Chained-CPI is a low measure of inflation, Social Security benefits will grow at a slower rate. Thus, liberals argue that Chained-CPI is a benefit cut. However, both CPI and chained-CPI estimate inflation for the average person. But Social Security beneficiaries are not average people. Most of them are elderly and much of their consumption comes in the form of health care and housing. Since health care and housing prices have risen faster than the rest of economy, the cost-of-living for seniors has increased at a quicker rate as well. That means that CPI and Chained-CPI both actually underestimate inflation for Social Security beneficiaries. Their benefits should actually rise quicker than inflation. But ultimately, the question of which you prefer likely has more to do with whether you think Social Security benefits need to be pared back to ensure the program’s long-run solvency, or whether you think the elderly need, if anything, a benefit bump. Those are policy questions, not technical ones, and all the debate in the world about chained CPIs and CPI-Es relative methodological merits won’t resolve them. As a technical matter, the best way to express this would be to start with the most accurate possible measurement of the price level (I might prefer the PCE deflator) and then inflate it by a fixed amount. But using a measurement of the price level that slightly overstates inflation works too. If we want to have real benefits increases slowly each year for beneficiaries, then let’s use Yglesias’s technical fix. But, let’s start by getting the level of inflation right. CPI is not correct. Chained-CPI is also not correct. The closest measure right now may be CPI-E, but it’s still experimental and not ready for use. In the end, I’m with Kevin Drum: let’s budget a small bit of money to research and develop a precise measure of inflation and then implement it. After that, we can start talking about inflating it by a fixed amount (as Yglesias advocates) or pairing benefits back altogether (as many Republicans advocate). First, though, let’s get it right.